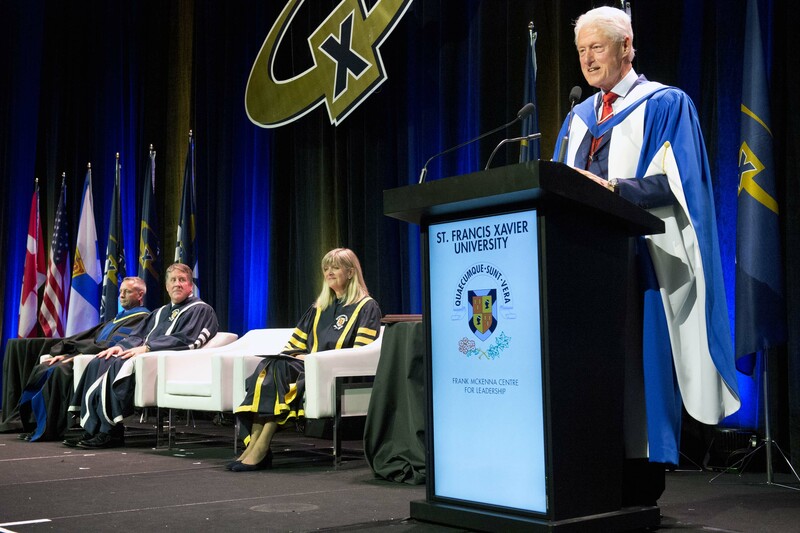 Bill Clinton, the 42nd President of the United States, is now a member of the St. Francis Xavier family, after accepting an honorary doctorate Tuesday evening in a special convocation ceremony in Toronto. “I love this country,” the former President, draped in blue and white graduation robes, declared in his convocation address. He received a standing ovation from the 600 guests attending the ceremony and dinner. “Committed to human rights, justice, and peace, President Clinton is recognized as one of the most distinguished world leaders. Described as a ‘political mastermind,’ President Clinton is also a person of ‘magnificent energy and creativity,’ and known for his eloquence, compassion and charm. In his address, Mr. Clinton noted that he is the only American President to have visited Canada five times when he was in office. He served from 1992 to 2000. Since then he has visited Canada nearly 50 times. One of those visits was to Antigonish in 2011 when he helped StFX alumnus Frank McKenna ’70, the former Canadian Ambassador to Washington and former New Brunswick Premier, open the Frank McKenna Centre for Leadership. 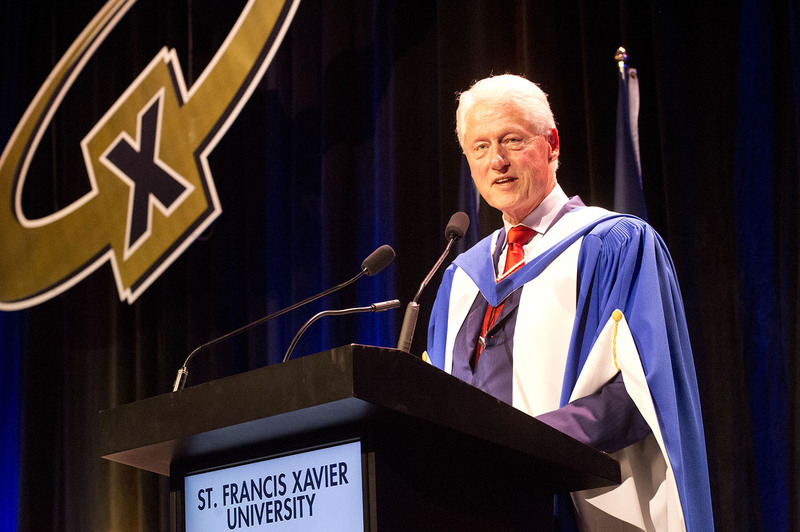 In his convocation address, Mr. Clinton spoke passionately about the state of global politics, arguing that people don’t take the time to reach out, and to really see each other. He called this the “culture of encounter” – and asked people to choose between that and the “culture of resentment” that he says is dominating politics these days. This was an evening devoted to the issue of leadership, and attracted leaders from business, academia, politics, and the arts, such as businessman and philanthropist Ron Joyce, former Ontario premiers David Peterson and Mike Harris, and there was even Hollywood stars — Maggie Q, from Designated Survivor, a show about a fictional American president. For Emily Gale, a recent graduate of StFX and a Frank McKenna Centre for Leadership ambassador, there is not one way to be a leader. Mike Boyd, Chair of the StFX Board of Governors, closed out the evening by giving special thanks to the evening's sponsors. The evening was presented by Agnico Eagle, in association with Onex and Ellis Don, and supported by Scotiabank, TD Bank and Sodexo.